If you think that your school life is/was bad, spare a thought for the students of Hope’s Peak Academy. Each student is hand-picked for being the “ultimate” something; ultimate baseball star, ultimate writing prodigy, ultimate musician, and so on. Rather than receiving an incredible education in the world’s most elite educational facility, however, these teens find themselves trapped with absolutely no visibility of, or contact with, the outside world. They are then told in no uncertain terms that their only hope of escape is to murder one of their classmates without getting caught. That’s got to be worse than double maths twice in one week, hasn’t it? Okay, so your school life is/was harder by default because you exist and they don’t, but still. So, yes, that’s the basic setup. The antagonist, and self-declared headmaster, is Monokuma. Despite the fact that him being a remote controlled teddy bear sounds rather ridiculous, Monokuma quickly establishes himself (herself? Itself?) as one of the most entrancing and memorable villains that you’ll come across. Ruthless, flippant, menacing, unpredictable, constantly wallowing in jet-black humour; this is a surreal and fascinating bad guy for a surreal and fascinating game. Well, surreal and fascinating games plural, actually. Apparently taking its cue from the Square Enix school of silly names (I’m looking at you, Kingdom Hearts series), Danganronpa 1.2 Reload is quite literally two games in one. This is actually the third outing for each game. Originally Japan-only PSP titles, they were later given a good ol’ polish for Vita versions, which managed to make their way to English-speaking territories. They were only very recently released on Steam and, now, as a 2-in-1 package for PS4. Don’t let the repeated re-releases put you off – this is top quality stuff. It doesn’t matter too much which game you play first, or even if you finish one before playing the other. To get the most out of the experience however, I definitely recommend finishing the first game before starting the second. This will allow the sequel to suckerpunch you even harder – but in a good way. The characters are literal cardboard cutouts. They’re not animated during the visual-novel-style storytelling, nor during the sequences when you’re free to wander around areas (and at these times, you can even see their 2D nature from the right angle). Impressively, the writing is more than strong enough to make them come alive and feel like real individuals, albeit caricatures rather than actual human beings. Be prepared to feel shocked or saddened by the revelation that one of your favourite characters turns out to be the next murderer – or the next victim. Once a murder has taken place, identifying the culprit might be very easy (most of the first game) or incredibly difficult (pretty much the whole of the second game). Regardless, the real fun and head-scratching comes from speaking to the survivors and gathering evidence afterwards, then pulling together everything you’ve found and learned to reconstruct the events of the crime and prove the guilt of the killer. 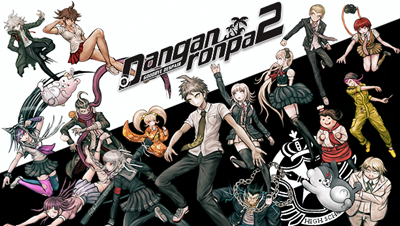 Each murder signals the approach of a ‘class trial’ you see, a mixture of sleuthing and minigames. Yes, I know ‘minigames’ is something of a dirty word, but these are thankfully of the non-annoying variety. They – and their associated time limits – add pressure to you and your mental athletics, and make a successful class trial sequence that much more satisfying. The game mechanics are sound, but it really is the writing and the atmosphere that will grip you until the end of both titles. The bright, bold, stylised graphics work perfectly in conjunction with the fuzzy synth soundtrack to ensure that Danganronpa’s bizarre world holds firm. The writing meanwhile is across both titles by turns intelligent, hilarious, shocking, thoughtful, and playful. Even if you wouldn’t ordinarily consider a “very Japanese” game, Danganronpa 1.2 Reload offers value for money of the highest order. This game displays a Danganronparticular set of skills.